Now that summer's here, it's super important to protect your keiki's head from the harsh sun. Even more important: making sure he or she looks stylish at the same time (hey, gotta start training 'em early). 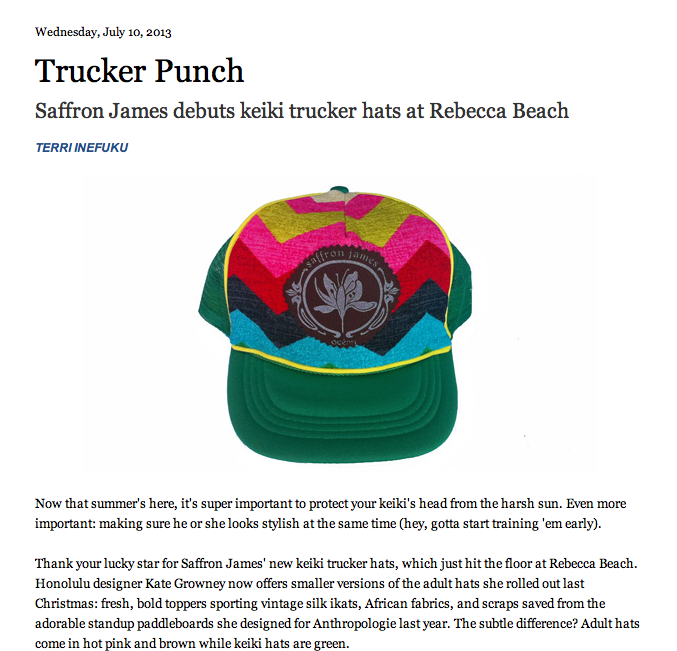 Thank your lucky star for Saffron James' new keiki trucker hats, which just hit the floor at Rebecca Beach. 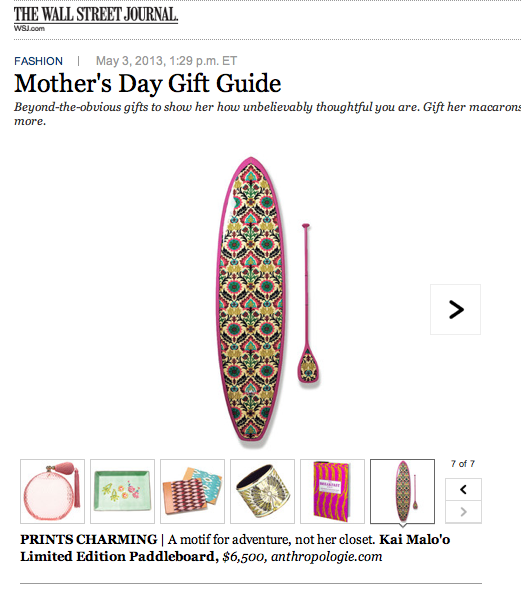 Honolulu designer Kate Growney now offers smaller versions of the adult hats she rolled out last Christmas: fresh, bold toppers sporting vintage silk ikats, African fabrics, and scraps saved from the adorable standup paddleboards she designed for Anthropologie last year. The subtle difference? Adult hats come in hot pink and brown while keiki hats are green. Right now, your child can be a beacon of bright in rainbow chevron, and Growney is planning to release a new pattern soon (sneak a peek below!). Sadly, this summer may be your only chance to snag one. Since each hat is handmade in-house using high-quality materials and finished with contrast piping, Growney doesn't know how much longer she'll be able to make them. So, grab one now and you won't flip your lid later. $46 each. Keiki trucker hats are available exclusively at Rebecca Beach, The Kahala Hotel & Resort. Adult trucker hats are available at both Rebecca Beach and SoHa Living, Kahala Mall. Photos courtesy:Saffron James. 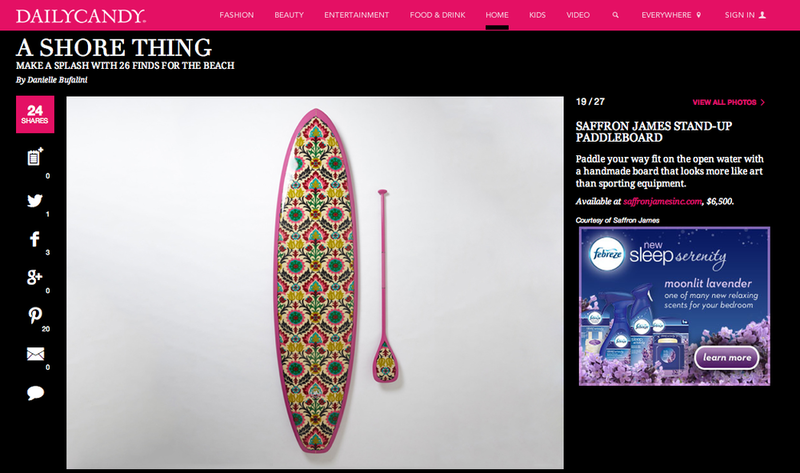 Paddle your way fit on the open water with a handmade board that looks more like art than sporting equipment. 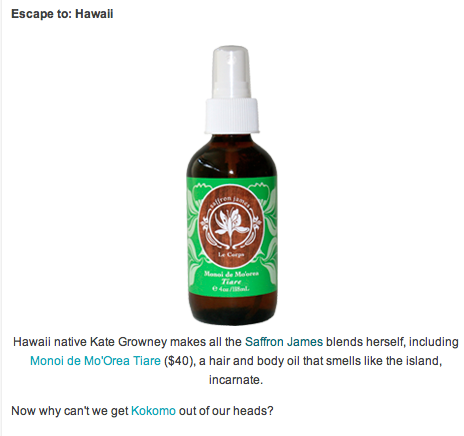 ($40), a hair and body oil that smells like the island, incarnate. The essence of over 2500 Gardenia flowers went into this bottle of mysticism. And, it’s a profound exception to the glut of Gardenia inspired body oils that muck up the marketplace. Yes, I’m finicky with my Monoi. The worst ones leave your skin scented with that bargain bin basket coconut scent that you’d only find in a waxy sunscreen. The best ones have been deeply seeped into Coconut oil and impart a smooth aura of a scent. Saffron James has created the latter. Saffron James is a cool-ish cult find. Carried at Ron Robinson (the purveyor of all things hip in LA), the brand is a line of Hawaiian-inspired fragrances and was founded by a former Elle/Harper’s Bazaar/Lucky beauty editor. Having grown up in Hawaii, Kate Growney knows a thing or two about the Tiare Gardenia and other exotic florals that are more often than not usually sold in synthetic form and packaged up for those weekend 3-for-1 specials. 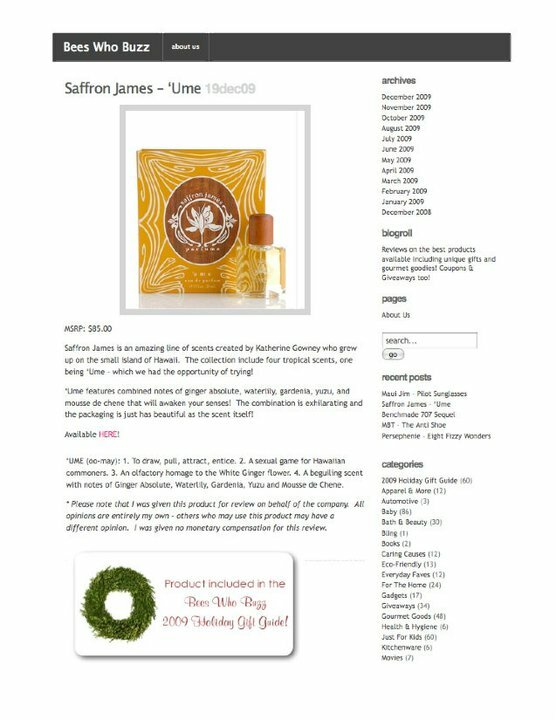 After years of writing on fragrances and the success launch of four wildly popular fragrances at high end retailers like Nordstrom, Saffron James has recently expanded into body oils. There’s something that excites the nerve when I hear about perfumers getting into the oil side of things. It’s how their brilliant blending efforts always give us richly potent and diffusive oils that are often drawn to simplicity. It’s all about the essence in its purest form, smartly ignoring the contemporary tendency to recreate a scent in an oil base. The bonus is when you can layer the body oils with the house’s signature scents. 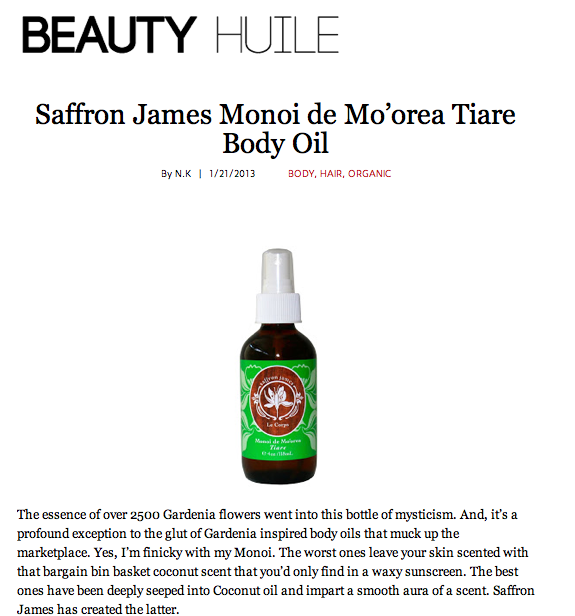 Saffron James’ Tiare Body oil ($40) smells like daytime leis, which seem like they are are carefully collected and cut from the first warm days of spring rising above the fragrant fields on the island of Mo’orea in French Polynesia Tahiti. Intensely soaked in a preservative-free Coconut Oil, the hair and body oil really shows off the refined beauty of Monoi in its unadulterated sense. First off, the oil is so pure that is actually solidifies at 76 F with its low melting point. And, because the bottle comes with a convenient pump, be sure to gently warm the treatment in a warm bath of water for a few minutes. Dare you not to microwave this deluxe oil as you’ll just hasten the breakdown of the carrier and essence. What follows is an astounding quality of an opulent Tiare with an irresistible draw. Gorgeously rich, the sweetened scent remains faithful to its flower’s burst and is warmed by the redolence of the Coconut oil. You can almost imagine the Tiare as a stately scent without the oil base, as the sultry lushness is quite wearable without cloy. The Tiare inspires so many repeat sniffs, I almost wish for a lighter carrier so I could be able to sniff the Tiare on its own. But, then I wouldn’t have the supremely dense moisturizing effects of the multifunctional Coconut oil, which is loaded with Vitamin E and fatty acids (such as lauric acid, myristic acid, capric acid and more) and helps strengthen underlying tissues and helps remove excessive dead cell on the skin's surface. The super rich oil has also scientifically been shown to work wonders on lifeless manes and split ends. So much so that even Virgin America's flight attendants swear by its use to prevent dehydrated scalps. Warm an ounce or two and work it into your hair as a weekly hair conditioner about a half hour before you shower. The oil does wash out with one shampoo rinse and leaves your locks glimmering with gloss. Want to get more use out of your Monoi? Try the Monoi oil as an attractive sheen to dry, chapped lips while treating the parched puckers. Or, make your own scented exfoliating face scrub with mixing an equal part of baking soda and oil and massage into face. Rinse with warm water to remove baking soda residue. Pristinely blended as an homage to Hawaii’s tropical flowers, the Monoi oil is worthy of your bucks. Ipo means "sweetheart" in Hawaiian and given this perfume's captivating blend, don't be surprised if it lives up to its name and lures that special someone. With pakalana, also known as Chinese Violet, at its core (the flower was introduced to Hawaii by Chinese immigrants in the 1820s) Saffron James' scent is enhanced with violet, Moroccan rose, orange blossom, and Tahitian gardenia. , Plumeria, Pakalana, and she just gave me a blank stare. I realized the flowers that I had grown up with, that were commonplace to me, most people had never seen, smelled, or even heard of," said Growney. 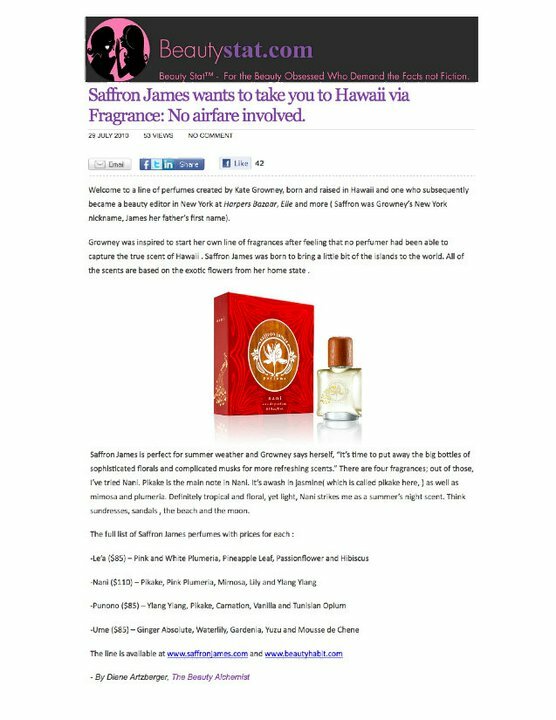 Thus, the idea for Saffron James Parfums, a line of Hawaiian-inspired scents, was born. (Saffron, being Gowney's nom de plume from her magazine days, and James, her father's name). The current collection includes four tropical scents, with plans to add a candle and body oils in the near future. Interestingly, Gowney is also a trained chef, drawing inspiration for her newfound career in perfumery from her experience with the delicate balances of food flavors and aromas. 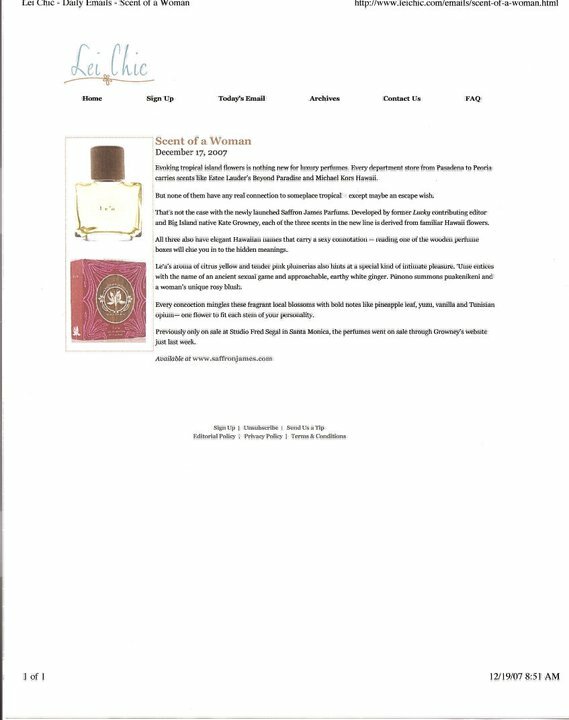 Find out more about the notes in her perfumes after the break. Le'a ($85) — Pink and white plumeria, pineapple leaf, passionflower, and hibiscus. 'Ume ($85) — Ginger absolute, waterlily, gardenia, yuzu, and mousse de chene. Pūnono ($85) — Ylang ylang, pikake, carnation, vanilla, and Tunisian opium. Nani ($110) — This scent, an homage to the Pîkake flower, pays tribute to the last crown princess of Hawaii, Princess Ka’iulani. and more ( Saffron was Growney’s New York nickname, James her father’s first name). A line of fragrances created from a line of complex florals that capture the mystery, humor and beauty of the Hawaiian Islands. 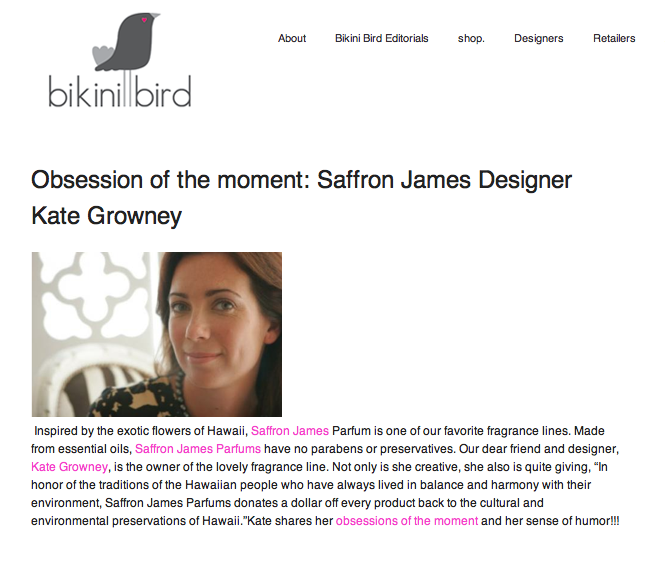 Saffron James Parfums’ creator and former beauty editor for ELLE, Lucky and Harper’s Bazaar Kate Growney, relied on her upbringing in the Hawaiian Islands to create this unique line of luxury fragrances. The fragrances smell beautiful and almost make you feel as if your on The Big Island itself. If you’ve been to the Hawaiian Islands before, these fragrances will bring all your memories rushing back.